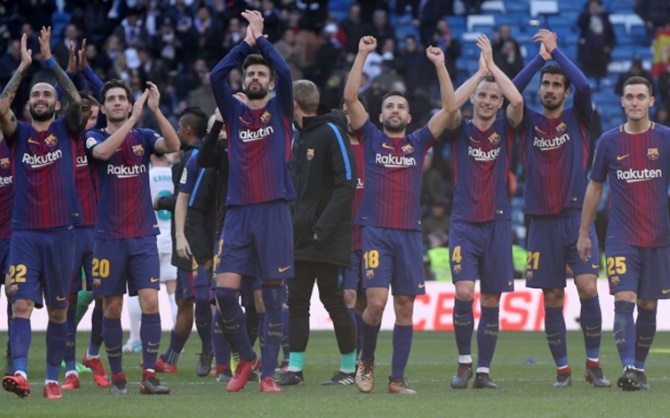 Real Madrid's hopes of retaining their La Liga title appeared to be fading fast as goals from Luis Suarez, Lionel Messi and Aleix Vidal propelled Barcelona to a 3-0 win in the 'Clasico' on Saturday, lifting them 14-points clear of their rivals in the standings. 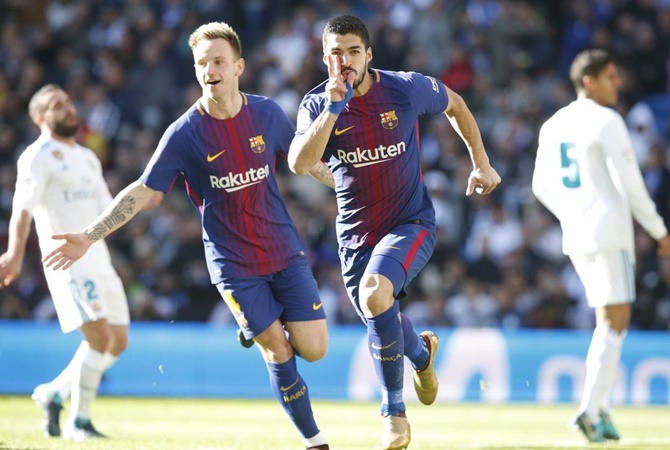 Suarez capitalised on wide open space in Madrid's midfield to knock in a simple pass from Sergi Roberto following a breakaway move in the 54th minute. That opened the scoring after a tense but tight first half in the early afternoon sun at the Santiago Bernabeu. Messi hammered in the second goal from the penalty spot 20 minutes later after Dani Carvajal was sent off for blocking a goal-bound header from Paulinho with his arm after Real were again easily picked apart on the counter attack. Catalan defender turned winger Vidal hit the third in injury time to pile more misery on Madrid, who looked unrecognisable from the side who crushed Barca 5-1 on aggregate in the Spanish Super Cup in August. Real failed to capitalise on their chances in the first half as Karim Benzema's header came off the post and Cristiano Ronaldo was denied by the flailing leg of Barca goalkeeper Marc-Andre ter Stegen. However, the European and Liga champions collapsed after the interval and Barca took full advantage. Barca are nine points clear of nearest challengers Atletico Madrid at the top of the standings although Valencia could climb to second and close the gap to eight points later on Saturday if they beat Villarreal. Real are 14 points adrift but have a game in hand. Is Smith a better Test batsman than Kohli?